Try wider pipes for more performance? I'm not sure you call stuff in plumbing bandwidth. This was not one of the "lets get something pretty/nicer/better" kind of projects, but one of necessity. Better to do it now than wait for it to become a emergency repair. I did get a little bonus though, 462 pounds of cast iron to the recycling center got me $55.50 plus the 30lbs of aluminium cans and 4lbs of copper/brass added another 22 bucks. I just need to install 4 shutoff valves under each bathroom sink then all shutoff valves in the house will be 1/4 turn ball valves. EDIT: well it looks like I'll be replacing the cold water supply valve to the water heater this weekend. Just noticed it was slowly dripping. It is 40+ years old too, and the old style multi-turn with rubber seals/seats. It'll be replaced by a ball valve. Have I mentioned the joys of owning a older home? My to-do list never seems to get shorter. Well the Water company charges you by Bandwidth usage. I'm back at it again, this time it's a outside project. The house sits at the bottom of a hill. We've had issues with water runoff on one side of the driveway thanks to the city not pitching the storm gutter correctly. It pools at the top right of the driveway (looking from the house toward the street) then runs off into the side yard creating a small river. 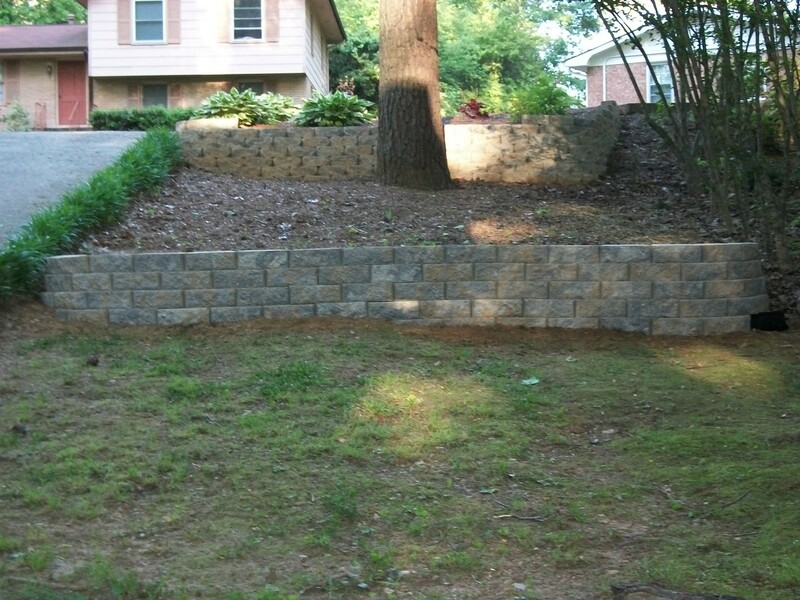 So I figured I could fix that with a short retaining wall. Phase 1 is complete. Phase 2 will be extending the wall across the the yard on the uphill side of the pine tree and back into the hill. 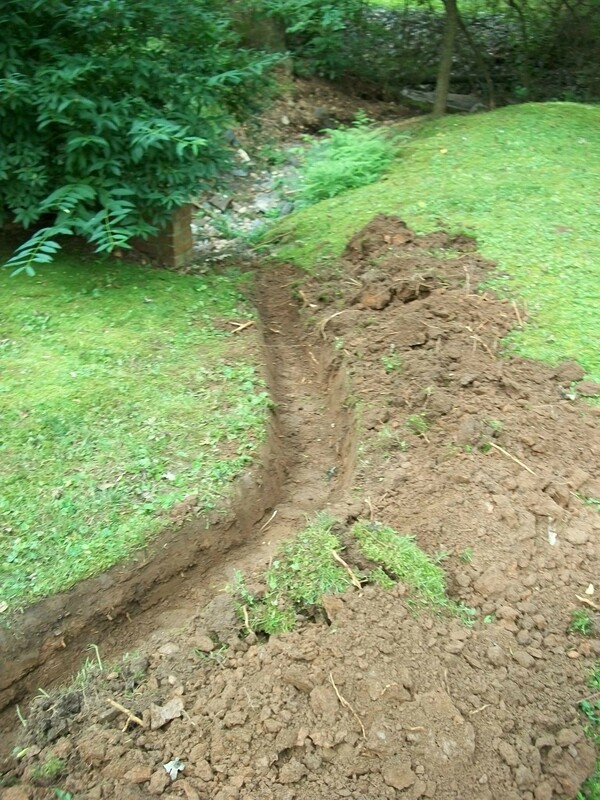 Then backfill, add topsoil and grade it to make it less steep and turn that area into a planting bed. Phase 3 & 4 will be 2 additional walls down the hill. One on the downhill side of the pine tree and another a little further down from that, creating a three level terrace. Looks sweet! Would all the Water run into your Garage if you had Rain? Only very heavy rain for a extended amount of time. Then it's only just a couple inches inside the door and about 1/8" deep at most. I have a plan for that too. The walls will be about 20" high (5 rows high) with one row in the ground (6 rows total) and I think I'll just do one more wall after this one. Just split the distance on where I was planning the 2nd & 3rd one. 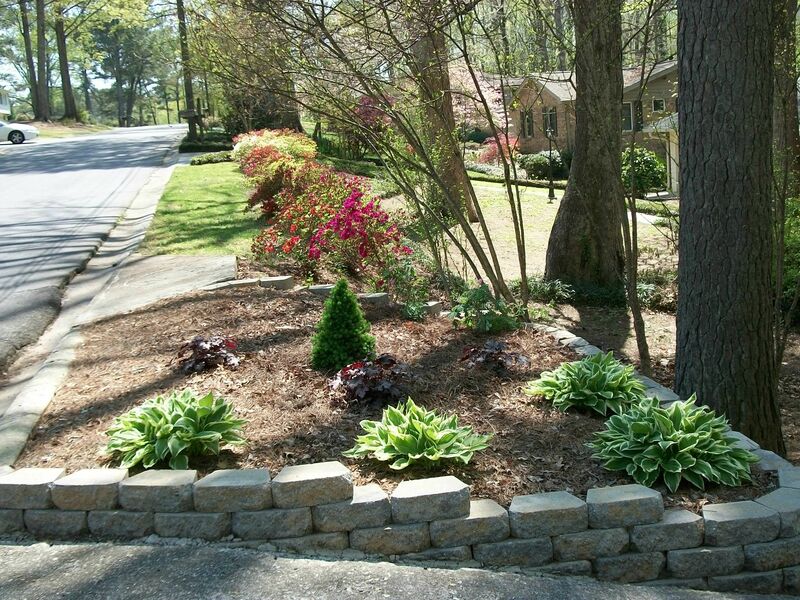 I need to transplant the hostas and extend the monkey grass up to the block. Get some fill dirt and topsoil delivered and about 120 more blocks to complete this section. Then another 120-140 for the second wall. It took 45 blocks just to do that small section. Planning on putting some sort of low juniper in the finished areas. 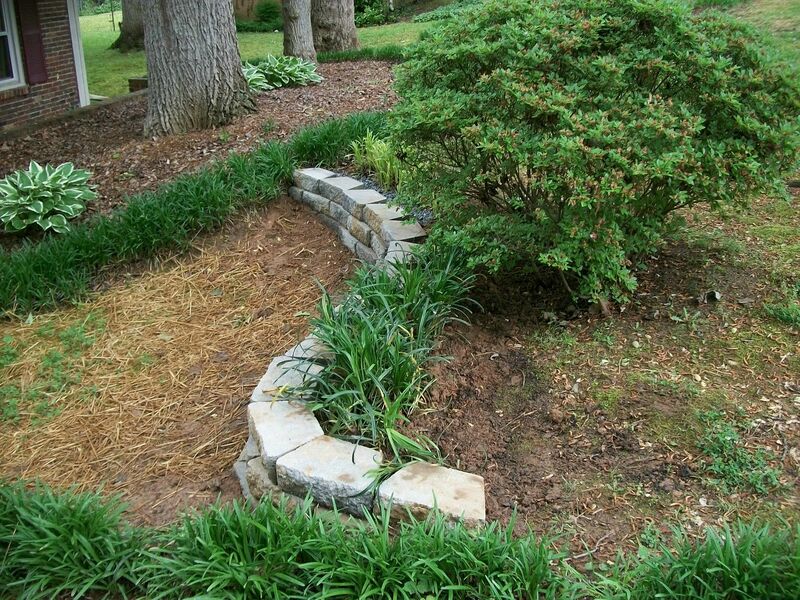 Then I need to make a plan for a few other areas in the yard. It just never ends. My grinder with a diamond blade (from my tile projects) made easy work of scoring the block, then a chisel and hammer to cleve it cleanly. Looks nice. 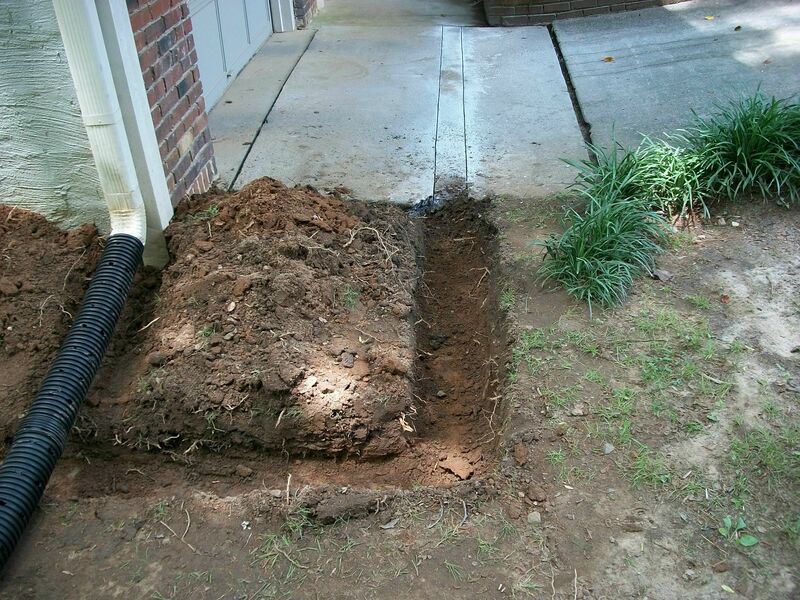 Do you have a drain at the bottom of you driveway? I remember some places in Vancouver had them for back slanting driveways to prevent flooding. Not yet, but thats going to happen..soon. Hasn't been much of a problem over the years, but I'm gonna take steps to make sure. There's a dip/slight cup in the driveway about 2 feet outside the garage door and the garage floor is pitched to go out the door. Gonna install a channel drain in the low spot. On a side note: Choosing plants and looking at all the specific needs of them is driving me crazy. My original choice of junipers isn't going to work. Seems they like a LOT of sun, which that area lacks. I made a list (Excel spreadsheet actually) of about 18 different plants that like full/partial shade. This phase of the project will end up under a grand (800-900) with plants. The driveway drain will be fairly cheap, about 200 bucks. Just under a grand is pretty decent. Post pics of the drain setup. Sorry for the lack of updates, was a little busy moving dirt/clay/stone. First off: this project was slightly bigger than I had thought. 144 blocks (12" wide 8" depth 4" height), 8 yards of fill dirt (Georgia Red Clay) 3 yards topsoil, 2 yards #57 granite. 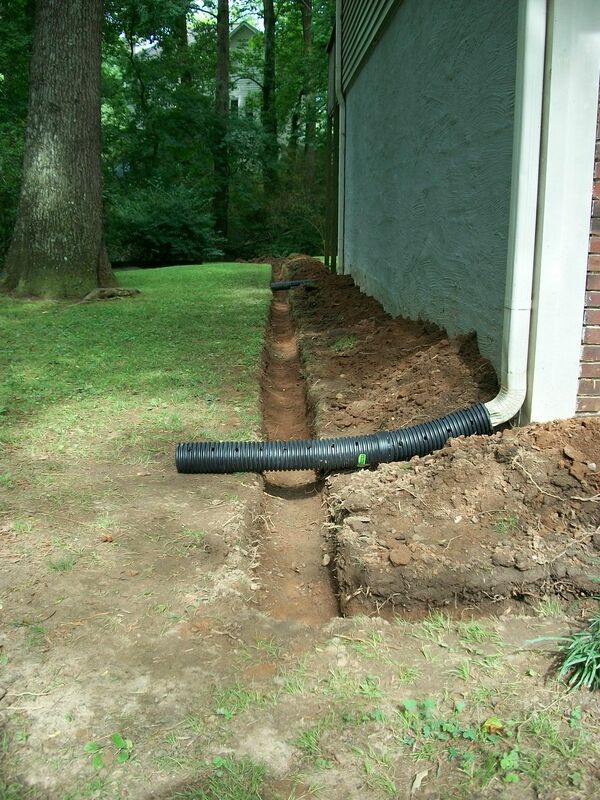 16' of 4" drain pipe (3 hole with filter sleeve). 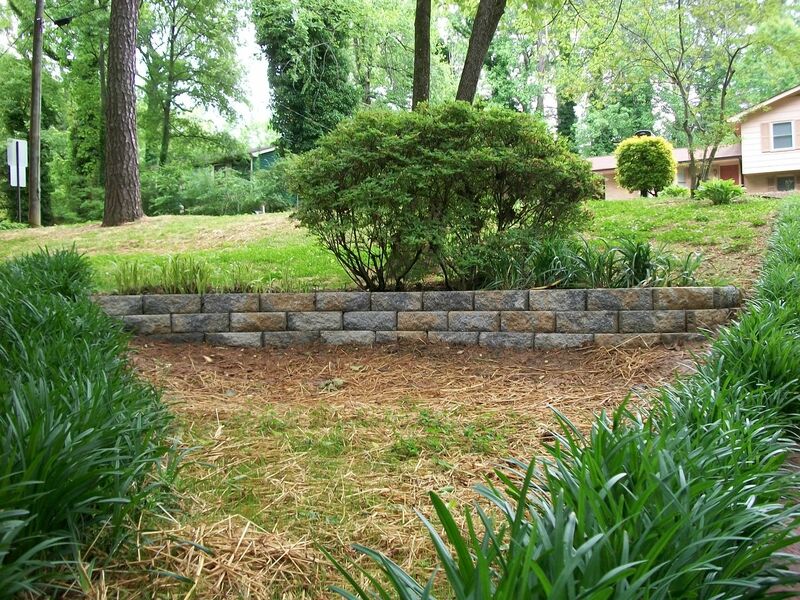 Used everything but maybe a yard or two of fill, used all blocks, stone and topsoil. It's sure nice to know someone with access to a Bobcat. because a wheelbarrow and shovel wasn't gonna cut it. Now waiting on the other half to tell me what to plant where. I don't think so. I could link each image. I need to add a few to it after putting the plants in this past Saturday. Phase II is pretty much done. Lol Imageshack - I thought all the APH-ers changed to imgur. Thanks guys. It was a TON of work. I really underestimated the labor involved. This project kicked my *** and I had to call in help to move all the dirt. I'd probably still be moving 11 yards of it by shovel and wheelbarrow. Using the Bobcat only took about an hour. I'm pretty happy with it, but more importantly the wife likes it. It's not really the plants I wanted because of planting so late, so choices were kinda limited. So it's been awhile, but more yard work has happened (also had to move to imgur). Got Phase 2&3 done of the wall blocks a month to two ago. I will be cutting the driveway this weekend to install the channel drain system and run pipe to catch it and the downspouts and dump it into the storm water culvert installed by the city. I did get most of the materials for this phase of the project already. Marked the width of the channel drain and used my hand held grinder with a diamond blade to score a straight line. Just need to pickup 30' more pipe a 45 bend and rent the 16" concrete saw to get all the way through the driveway, then some (lots) of digging. About 80' total and at least 10" deep at the far end for the proper pitch. 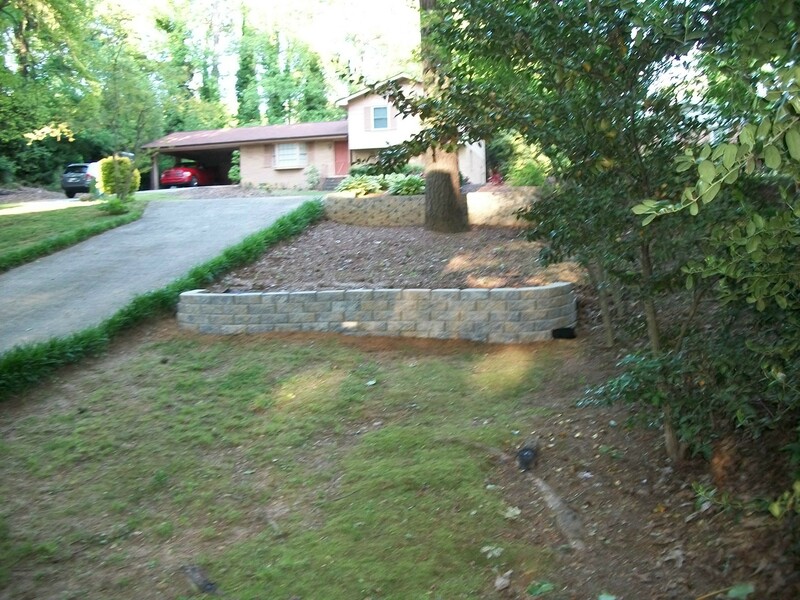 Phase 2: Small curved wall on the left side of the driveway (looking from the house). Phase 3: Shorter wall below the original one. Both walls line up across the driveway from each other. Also seeded some test areas with some fescue, mainly to cover some bare areas and see how it would do. Will be tilling and putting seed down (and some topsoil to re-grade some areas) in the rest of the front and sides this fall with the same grass seed based on the results so far. Then do the back next spring. Also changed some plants in the upper wall area. Kept the Hostas and Coral Bells, but added a Dwarf Alberta Spruce (as the center/focal plant) and a Bleeding Heart on the far side. Still looking for things to fill in between the other ones. I really want to get some solar powered Christmas lights for the mini spruce this holiday season. Thanks man, Has it really been that long? If so, with just one person doing all the work on weekends and maybe a few hours after work during the week, it takes time, but I've just about got it where I want and the list is getting really short. Wow yeah, this thread was started in 2010. Yeah it was, wow, how time flies when you're having fun. Made some progress with the drain project. Most of the digging is done, just some fine tuning for the proper pitch. 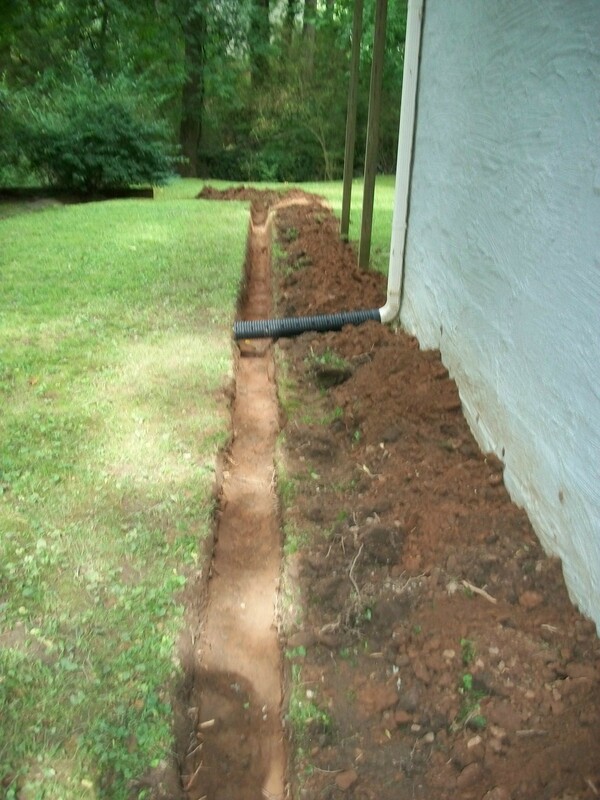 Driveway scored and the channel drain assembled. 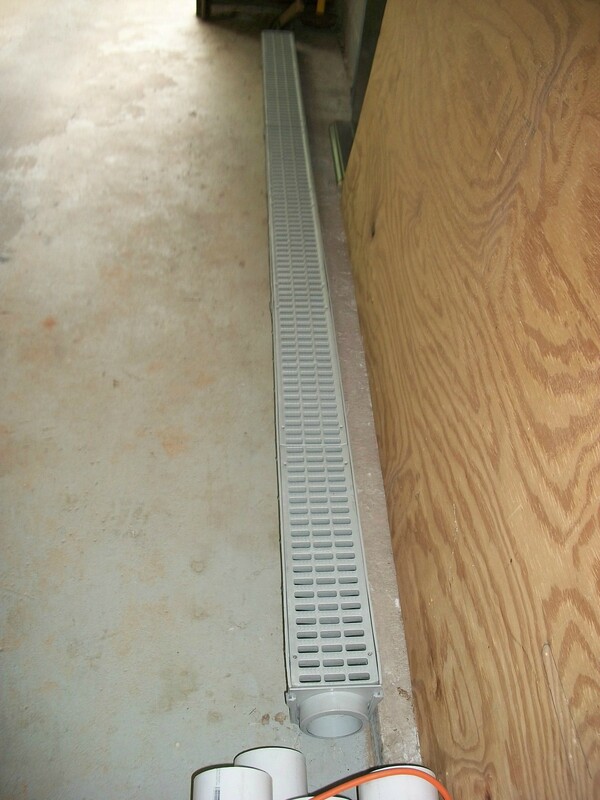 I used 3 of these NDS Pro Series 5"x40" Channel Drain & Grate kits. That's one mighty fine looking trench. Also the black plastic pipes on the downspouts are just temporary until I run the 4" sewer pipe and fittings. Looks really good - thanks for all the great photos! You did it all Yourself? Impressive. Yep, just me and a shovel or two and a pick ax. There's more to come, but I wanted to get most of the digging part out of the way. Took about 2 hours a day since Tuesday to dig the trench. That's all I could handle after work. I should finish up digging tomorrow evening with the short sections to the downspouts. Then Saturday morning make a trip to HD to rent the saw and pick up a few more sections of pipe and hope to be done installing the drain and pipe by beer-thirty (4:30pm). I'll backfill the trench Sunday most likely, depends on how Sat. goes. So far I'm on track for where I wanted to be come Saturday morning. EDIT: Nature decided to give my trench a test this evening. So I grabbed the umbrella and watched what the water did. Only a couple of spots need minor adjusting which was about what I was expecting. I haven't even broke out the level or anything yet, it's all been by eye so far.